Not to be confused with Bakugan. The cover of the first tankōbon, released in Japan by Shueisha on January 5, 2009, featuring Moritaka Mashiro. Bakuman, stylized as Bakuman。 (バクマン。), is a Japanese manga series written by Tsugumi Ohba and illustrated by Takeshi Obata, the same creative team responsible for Death Note. It was serialized in the magazine Weekly Shōnen Jump from August 11, 2008 to April 23, 2012, with the 176 chapters collected into 20 tankōbon volumes by Shueisha. The story follows talented artist Moritaka Mashiro and aspiring writer Akito Takagi, two ninth grade boys who wish to become manga artists, with Mashiro as the artist and Takagi as the writer. Some characters resemble real authors and editors of Weekly Shōnen Jump, and many manga titles mentioned in Bakuman have actually been published in the magazine. An anime television adaptation of the series created by J.C.Staff began airing on NHK-E on October 2, 2010. The third and final season of which ended broadcast on March 30, 2013. A live-action film adaptation was released on October 3, 2015. Bakuman was the seventh best-selling manga series of 2011 and the tenth best of 2012, and had over 15 million volumes in circulation by May 2014. Additionally, it is the first manga released online by Shueisha in multiple languages before becoming available in print outside Japan. In 2009, Viz Media announced it had licensed the series for a North American release. Besides releasing the series in collected volumes, they also released it in their online manga anthology Weekly Shonen Jump Alpha. When Moritaka Mashiro, a junior high student, forgets his notebook in class, he finds his classmate, Akito Takagi, who notes Mashiro's drawings. Takagi asks him to become a manga artist to his stories. Mashiro declines, citing his late manga artist uncle, who died from overworking. Takagi incites Mashiro to meet with Miho Azuki, Mashiro's crush, and tells her the two plan to become manga artists. In response, Azuki reveals her plans to be a voice actress. Mashiro proposes to her that they should both marry when Azuki becomes a voice actress for the anime adaptation of their manga. She accepts, but under the condition that they not meet face-to-face again until then. The two then start creating their manga, under the pen name Muto Ashirogi, in hopes of getting serialized in Weekly Shōnen Jump. After submitting many one-shots to Shueisha, Ashirogi begin with their first published series in Weekly Shōnen Jump, Detective Trap (疑探偵TRAP（ぎたんていトラップ）, Gitantei Torappu), which is eventually canceled due to its declining popularity, after Mashiro is hospitalized for overworking on the manga. Their next series is the gag manga Vroom, Tanto Daihatsu (走れ!大発タント, Hashire! Daihatsu Tanto), which they give up on, realizing it will never be popular, coupled with Takagi's difficulty with writing rapid-fire humor. After being challenged by the editor-in-chief of Jump to create a superior manga to their rival's, Ashirogi develops their current series Perfect Crime Party (PCP -完全犯罪党-, PCP -Kanzen Hanzaitō-). It is met with considerable popularity but due to its theme, is unfit for an anime series. When their rival, Eiji Nizuma, submits a one-shot for serialization, Ashirogi competes by submitting Reversi which replaces Perfect Crime Party while the latter is moved to Shueisha's fictional monthly magazine, Hisshou Jump. After many conflicts involving the graphic novel sales and the voice actress choice, Reversi is chosen for an anime adaptation with Miho as the primary actress, after she passes a public audition. After fulfilling their dreams, the series ends with Mashiro officially proposing to Miho at the place they made their promise, the front gate of Miho's old home, followed by their first kiss. Tsugumi Ohba came up the idea for Bakuman after thinking of all the people who long to be manga artists. Because he is in the industry, he felt he could create a manga about manga. He said that for the fictional manga created in the series, he did not worry about the plot and settings, only focusing on "cranking them out." He revealed that he did actually make storyboards for the fictional The Classroom of Truth, and one he created for Otter No. 11 is actually seen in Bakuman. When creating a chapter, Ohba does not meet with Takeshi Obata. He discusses things with his editor and creates storyboards that are given to Obata. Obata then creates his own storyboards that are given to Ohba and their editor. The author said only minor changes are made and they never have disagreements. Ohba referred to Bakuman as "a weird series." He revealed that the hardest part was coming up with new ideas as the story kept getting longer. But said because of this, he was able to include stories that he never initially considered. When asked how accurate the manga process depicted in Bakuman is to reality, current Weekly Shōnen Jump editor-in-chief Hiroyuki Nakano said that as a work of fiction, some things are exaggerated for dramatic effect, "But it takes a lot of details from real life, so I think it's quite close." Written by Tsugumi Ohba and drawn by Takeshi Obata, Bakuman was serialized in Shueisha's Weekly Shōnen Jump magazine from its premiere on August 11, 2008 to its end on April 23, 2012. The 176 chapters were then collected into 20 tankōbon volumes from January 5, 2009 to July 4, 2012. Several chapters of the series were released on Jumpland's official website in Japanese, English, French, and German; the first chapter released on August 19, 2008. It is Shueisha's first manga to be released online in multiple languages before becoming available in print outside Japan. A 15-page one-shot of the series Otter No. 11 (ラッコ11号, Rakko 11-gō), the gag manga created by the character Kazuya Hiramaru in Bakuman, was published in the August 8, 2010 issue of Weekly Shōnen Jump. It was then published the following week in Shōnen Jump Next on August 16. Viz Media included an English translation of it in the free SJ Alpha Yearbook 2013, which was mailed out to annual subscribers of Weekly Shonen Jump Alpha in December 2012. In commemoration of the live-action film release, two new chapters were created by Ohba and Obata under the title Bakuman. Age 13 (バクマン。 age13). They are set before Takagi and Mashiro first met, with the first chapter published in Weekly Shōnen Jump on September 21 and the second on September 28, 2015. In addition to the success of Bakuman in Japan, the series has also been licensed worldwide: in Korea by Daiwon C.I. and serialized in their Comic Champ manhwa magazine, by Tong Li Publishing in Taiwan, Kana in France, Norma in Spain, Tokyopop in Germany, Comics House in Malaysia, Kim Dong Publishing House in Vietnam, in Brazil by Editora JBC and NED in Thailand. At San Diego Comic-Con International 2009, Viz Media announced it had licensed the series for English release in the US and Canada. The first volume was released on August 3, 2010, and all 20 volumes have been published as of August 6, 2013. In addition to the collected volumes, Viz also published the series online in their manga anthology Weekly Shonen Jump Alpha (now known as simply Weekly Shonen Jump). Bakuman started with chapter 162 in the anthology's debut issue on January 30, 2012, and ended with the series' final chapter released on May 7, 2012. Viz digitally released the two Bakuman. Age 13 chapters in Weekly Shonen Jump on the same days that they ran in Japan. A 25-episode anime television series based on Bakuman was announced in Weekly Shōnen Jump's second issue of 2010. Created by J.C.Staff, it began broadcasting on NHK on October 2, 2010 and ran until April 2, 2011. In December 2010, Weekly Shōnen Jump announced that a second season would air in Fall 2011; it ran from October 1, 2011 to March 24, 2012. A third and final season was announced in the 3/4th (2012) combined issue of Weekly Shōnen Jump and began airing on October 6, 2012. It ran for 25 episodes between October 6, 2012 and March 30, 2013. In August 2011, Media Blasters licensed the first two seasons of the Bakuman anime for North America, including an English-language dub. The first seven episodes were included on a 2-disc DVD set released on November 22, 2011, however, the second was halted in February 2012. The first Blu-ray release was cancelled indefinitely in June 2012. Viz Media Europe acquired the rights for release in Europe and the United Kingdom in March 2012, in collaboration with Manga Entertainment and Kazé. After Media Blasters' cancellation, Kazé revealed the UK release would be subtitled only. In November 2012, Media Blasters officially announced they are discontinuing the series, but added that Viz Media might pick up the license for NA. A live-action film adaptation of Bakuman was released on October 3, 2015. Written and directed by Hitoshi Ohne (Moteki), the film stars Takeru Satoh as Moritaka Mashiro and Ryunosuke Kamiki as Akito Takagi. Japanese rock band Sakanaction performed the soundtrack, Motion Music of Bakuman, including the theme song "Shin Takarajima", which they released as a single four days before the film's release. A video game based on Bakuman was made for the Nintendo DS by Namco Bandai Games. Bakuman. : Mangaka e no Michi (バクマン。マンガ家への道, "Bakuman. : The Road to Becoming a Manga Artist") was released in Japan on December 15, 2011. A novel titled PCP -Perfect Crime Party- and based on the fictional manga of the same name created by Takagi and Mashiro in Bakuman was released by Shueisha on October 2, 2015. It was written by Sei Hatsuno, although Takagi and Mashiro's fictional pen name "Muto Ashirogi" is credited with the original story. Bakuman was nominated for the third annual Manga Taishō award in 2010. The first volume of the series placed fourth on the Oricon manga chart during its debut week, selling 154,675 copies. The second volume followed suit, placing second during its first week with 228,056 copies. The third volume continued the trend and placed fourth during its debut week, selling 200,369 copies. During the first half of 2009, the first volume placed twenty-eighth and the second volume placed twenty-seventh on Oricon's list of fifty top-selling manga in Japan, selling 381,633 and 394,567 copies respectively. 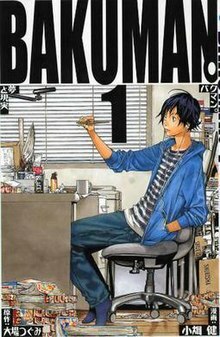 Bakuman was the seventh best-selling manga series of 2011, with almost 4.4 million copies sold, and the tenth best of 2012, with over 3.2 million sold that year. As of April 2012, over 13 million copies had been sold, with this number growing to over 15 million copies in publication by May 2014. In the United States, volume one debuted at number 6 on The New York Times Manga Graphic Books list for the week of August 12 and remained on the list for eight weeks straight. Jason Thompson referred to Bakuman. as "a love letter to the manga industry done in old-school shonen manga style." He felt that while it can be "text-heavy" on the process of making manga, it is ultimately a "heroic story of self-improvement, friendship and striving to succeed." Thompson cited the villain characters as the most interesting, but called the series sexist for only portraying females as either "bitter, man-hating viragos motivated by grudges against men" or "patient helpmates" striving to support them instead. Carlo Santos of Anime News Network praised the conflicting viewpoints of the protagonists and was surprised that the series succeeds, not only as a manga about manga, but as a slice-of-life story about the dreams of youth. However, Santos remarked that the series could learn from Ohba and Obata's previous serial Death Note; commenting that the beginning is not as gripping and the plot twists are "pretty weak" and "seem like petty contrivances." Despite this, he believes that the series is "another hit." Christopher Butcher reviewing volume one for About.com had strong praise for the art, calling it "quite possibly the best-drawn manga out today." He also enjoyed the behind-the-scenes information on the manga industry. Like Thompson, Butcher did state that while he enjoyed it, he has reservations about recommending Bakuman. because it is "horribly sexist." The film was number-one at the Japanese box office on its opening weekend, with US$2.1 million. It earned US$1.15 million during the October 18 weekend. At the 39th Japan Academy Prize awards, its editor Yasuyuki Ōzeki won the Japan Academy Prize for Best Film Editing award, while Sakanaction's Motion Music of Bakuman won the Outstanding Achievement in Music award. The film was also one of two releases that won the Popularity award, alongside Maku ga Agaru. Matt Schley of Otaku USA wrote that Bakuman. is "a real celebration of and testament to the unique power of Japan's comics culture" and the best live-action manga adaptation he's seen this year. Kotaku's Toshi Nakamura also suggested that it is possibly the best live-action manga adaptation he's seen. However, he said the motivational romance between Mashiro and Azuki was "surprisingly inconsequential" and boring. Mark Schilling for The Japan Times gave the film four out of five stars, with strong praise for director and screenwriter Hitoshi Ōne. ^ "The Official Website for Bakuman。". Viz Media. Retrieved October 27, 2017. ^ Santos, Carlo. "Bakuman GN 1 - Review". Anime News Network. Retrieved July 23, 2018. ^ Santos, Carlo. "Bakuman GN 15 - Review". Anime News Network. Retrieved July 23, 2018. ^ a b c "INTERVIEW: Tsugumi Ohba". Viz Media. May 28, 2012. Retrieved January 21, 2017. ^ "Death Note Creators Confirmed to Launch Bakuman Manga". Anime News Network. August 3, 2008. Retrieved August 22, 2008. ^ "Bakuman Manga to End on Monday, April 23". Anime News Network. April 18, 2012. Retrieved December 20, 2012. ^ "バクマン./1| 小畑 健/大場 つぐみ" (in Japanese). Shueisha. Retrieved January 17, 2009. ^ "バクマン./20 | 小畑 健/大場 つぐみ" (in Japanese). Shueisha. Retrieved May 16, 2012. ^ "Death Note Team's Bakuman Manga Posted in 4 Languages". Anime News Network. August 19, 2008. Retrieved January 31, 2009. ^ "Bakuman's Manga-in-Manga Otter #11 to Be Published". Anime News Network. August 2, 2010. Retrieved December 20, 2012. ^ "Bakuman's Otter #11 Also Runs in Shonen Jump Next Mag". Anime News Network. August 12, 2010. Retrieved December 20, 2012. ^ a b "Bakuman. Manga Gets 2 New Prequel Chapters This Month". Anime News Network. September 10, 2015. Retrieved September 10, 2015. ^ "Bakuman, Death Note Creators Launch Platinum End Manga". Anime News Network. September 24, 2015. Retrieved September 24, 2015. ^ "BAKUMAN" (in Korean). Daiwon C.I. Retrieved February 2, 2009. ^ "Viz's Shonen Jump Adds Bakuman, Tokiko Manga". Anime News Network. July 24, 2009. Retrieved July 24, 2009. ^ "Bakuman., Vol. 1". Viz Media. Archived from the original on July 17, 2012. Retrieved January 22, 2011. ^ "Bakuman., Vol. 20". Amazon.com. Retrieved December 20, 2012. ^ "Viz to Launch Weekly Shonen Jump Alpha Digital Anthology". Anime News Network. October 14, 2011. Retrieved December 20, 2012. ^ "Viz's Shonen Jump to Run New Bakuman. Prequel Chapters, Samon the Summoner Preview". Anime News Network. September 14, 2015. Retrieved September 14, 2015. ^ "Bakuman. Manga's TV Anime Confirmed for Fall 2010". Anime News Network. December 10, 2009. Retrieved December 11, 2009. ^ "Bakuman Manga Gets 2nd TV Anime Next Fall". Anime News Network. December 14, 2010. Retrieved July 27, 2011. ^ "Bakuman 2 TV Anime Slated for October 1". Anime News Network. August 29, 2011. Retrieved December 20, 2012. ^ "Bakuman Manga Gets 3rd TV Anime Next Fall". Anime News Network. Retrieved May 5, 2012. ^ "Media Blasters Confirms It Licensed Bakuman Season 2". Anime News Network. August 29, 2011. Retrieved December 20, 2012. ^ "Bakuman: First Issue". Amazon.com. Retrieved December 20, 2012. ^ "Media Blasters Halts Releases of Bakuman., Ikki Tousen Great Guardians". Anime News Network. February 3, 2012. Retrieved December 20, 2012. ^ "Retailer: Media Blasters Cancels 1st BD Volume of Bakuman". Anime News Network. June 15, 2012. Retrieved December 20, 2012. ^ "Viz Media Europe Acquires Bakuman Rights for U.K." Anime News Network. March 27, 2012. Retrieved December 20, 2012. ^ "Bakuman To Be Released Sub-Only". Anime News Network. September 25, 2012. Retrieved December 20, 2012. ^ "Media Blasters: No More Bakuman Plans, Anime May Go to Viz". Anime News Network. November 1, 2012. Retrieved November 4, 2012. ^ a b "Kenshin's Takeru Satoh & Ryunosuke Kamiki Star in Live-Action Bakuman Film". Anime News Network. May 7, 2014. Retrieved May 7, 2014. ^ "サカナクション「バクマン。」主題歌シングル限定盤に劇伴CD" (in Japanese). Natalie. August 4, 2015. Retrieved August 4, 2015. ^ "Bakuman DS Game Has Players Create A Manga". Siliconera. August 5, 2011. Retrieved July 9, 2013. ^ "How To Create A Manga Plot, Bakuman Video Game Style". Siliconera. November 10, 2011. Retrieved July 9, 2013. ^ "10 Titles Nominated for 3rd Manga Taisho Awards". Anime News Network. 2010-01-18. Retrieved January 21, 2015. ^ "Japanese Comic Ranking, January 6–12". Anime News Network. January 14, 2009. Retrieved January 31, 2009. ^ "Japanese Comic Ranking, March 3–9". Anime News Network. March 18, 2009. Retrieved March 28, 2009. ^ "Japanese Comic Ranking, June 1–7". Anime News Network. June 10, 2009. Retrieved June 15, 2009. ^ "Top-Selling Manga in Japan by Volume: 1st Half of 2009". Anime News Network. June 15, 2009. Retrieved June 16, 2009. ^ "Top-Selling Manga in Japan by Series: 2011". Anime News Network. November 30, 2011. Retrieved December 20, 2012. ^ "30 Top-Selling Manga in Japan by Series: 2012". Anime News Network. December 2, 2012. Retrieved December 20, 2012. ^ バクマン。 ： 累計1300万部の人気マンガが連載4年で幕　10年越しの主人公の恋の行方描く (in Japanese). Mantan Web. Retrieved February 10, 2014. ^ "Graphic Books List". The New York Times. August 12, 2010. Retrieved August 25, 2010. ^ "Graphic Books List". The New York Times. September 30, 2010. Retrieved October 9, 2010. ^ Thompson, Jason (March 26, 2015). "Bakuman. - House of 1000 Manga". Anime News Network. Retrieved March 29, 2015. ^ Santos, Carlo (March 31, 2009). "30 Seconds to Pluto - RIGHT TURN ONLY!!". Anime News Network. Retrieved May 23, 2009. ^ Butcher, Christopher. "Bakuman Volume 1". About.com. Retrieved 2014-08-04. ^ Mark Schilling (October 7, 2015). "Japan Box Office: 'Bakuman' Lands in Top Spot". Variety.com. Retrieved October 7, 2015. ^ Mark Schilling (October 19, 2015). "Japan Box Office: 'Library Wars 2' Wins Second Weekend". Variety.com. Retrieved October 21, 2015. ^ a b "【日本アカデミー賞】『海街diary』が最多4冠 "4姉妹"が歓喜" (in Japanese). Oricon. March 4, 2016. Retrieved March 6, 2016. ^ "Bakuman: Live-Action Film Review". Otaku USA. 2015-10-12. Archived from the original on 2015-11-14. Retrieved 2015-11-24. ^ "A Wonderful Movie About The Hardships Of Making Manga". Kotaku. 2015-10-16. Retrieved 2015-11-24. ^ "'Bakuman' depicts a life-or-death quest for manga success". The Japan Times. 2015-10-07. Retrieved 2015-11-24.